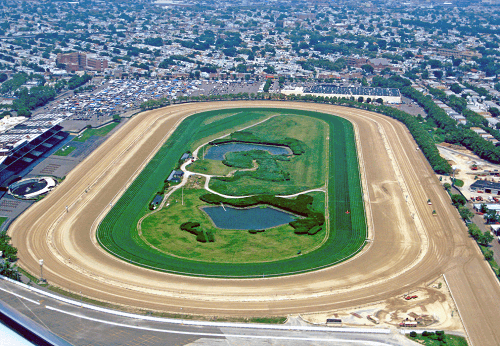 The Aqueduct Racetrack, or the Big A, is one of New York’s three big thoroughbred tracks. It is also one of America’s best racetracks. It has both a turf and dirty racetrack, and attracts a lot of bettors from around the country. This makes betting on races at the Aqueduct Racetrack highly lucrative and worth looking into. Let’s take a look at the best online racebooks for betting at the Big A, entries and free picks at the racetrack, and some notable Aqueduct Racetrack results over the years. American horse racing betting fanatics no longer have to leave their homes and face the frigid New York October to April temperatures to place bets. There are some great online racebooks accepting bets on the Aqueduct Racetrack. We’ve listed some of the best bookies for horse racing open to bettors from the United States. They offer the best bonuses, odds, and loyalty programs if you stick with them. Races at the Aqueduct Racetrack run from October to April. The event features more race dates than any of the other racetracks in New York. Also, the Big A is considered to be one of the best betting venues but because of the season, it prevents most people from experiencing the on-track excitement. Thanks to the growing market of horse racing bookies online, horse race betting is now more accessible. Cigar Mile: this is a grade one event for horses older than three. Usually, it’s held on the Saturday after Thanksgiving in late November. The Cigar Mile is important in the breeding world for giving credential to a stallion before it retires. Wood Memorial: another grade one event at the Aqueduct. Held in April, this racing event pits the nation’s top three-year old stallions against each other, competing for a spot in the Kentucky Derby. Carter Handicap: this is also a grade one event held early in April. It’s open to stallions three-years and older, and it’s run on a dirt turf. 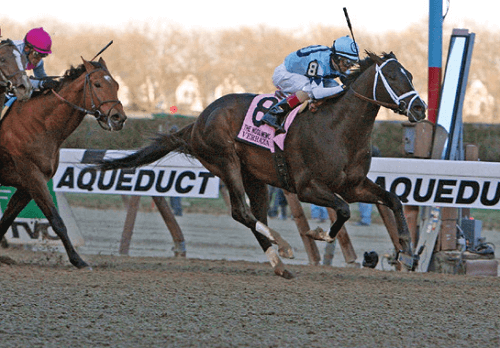 Gazelle Stakes: this a grade two event at the Aqueduct open to three-year old fillies. The Gazelle Stakes are run in early April, and they’re considered as a stepping stone to the Breeders’ Cup Distaff race. Gotham Stakes: also, another grade two event for horses held early in March. This race is the final local preparation for the Wood Memorial and an official preparation race for the Kentucky Derby. One thing horse racing bettors need to keep in mind is that tracks have biases and tendencies that can be used as an advantage in picking horses. The racetrack at Aqueduct has a layout with two dirt tracks with an inner and outer shape. The outer one is used during the colder months of December, January, February, and March. Meanwhile, Aqueduct Racetrack’s inner course is kind to horses with early speed or those that gain momentum from the gate and maintain it throughout the run. Let’s take a look at some of the most notable bets US bettors can place at the Aqueduct. The Aqueduct Racetrack results often give great multi-race payouts, especially in the Pick 4 and Pick 6 pools. Pick 4 pool: the point of this bet is to pick the winner of four consecutive races. Pick 6 pool: the point of this bet is to choose the winner of six consecutive races. A great aspect of this type of bet is in its structure. Bettors build tickets using multiple horses in each race. If a bettor uses four horses in one race, only one of the horses needs to win to keep the ticket moving along to the next bet. The more horses on a ticket, the more the bet costs. Players can calculate the total cost of a wager by multiplying the base bet by the number of horses in each leg. The Big A has had many legendary horses win races on its tracks. Cigar, who the Cigar Mile was named after, won in 1994 when it was still the New York Racing Association (NYRA) Mile. Cigar had racked up 16 consecutive wins.